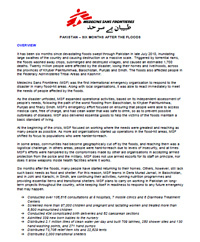 A report on MSF's response to the devastating floods swept through Pakistan in late July 2010, six months later. 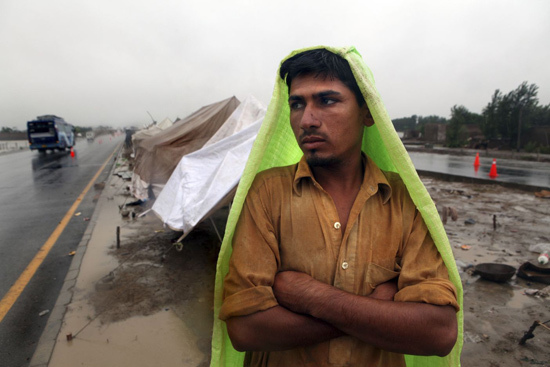 A man stands in the rain on a muddy shoulder along a road, where displaced people set up tents after their homes were destroyed during the floods. It has been six months since devastating floods swept through Pakistan in late July 2010, inundating large swathes of the country and causing destruction on a massive scale. Triggered by torrential rains, the floods washed away crops, submerged and destroyed villages, and caused an estimated 1,700 deaths. Twenty million people were affected by the disaster, losing their homes and livelihoods, across the provinces of Khyber Pakhtunkhwa, Balochistan, Punjab, and Sindh. The floods also affected people in the Federally Administered Tribal Areas and in Kashmir. Doctors Without Borders/Médecins Sans Frontières (MSF) was the first international emergency organization to respond to the disaster in many flood-hit areas. Along with local organizations, MSF teams were able to react immediately to meet the needs of people affected by the floods. As the disaster unfolded, MSF expanded operational activities based on its independent assessment of people’s needs, following the path of the worst flooding from Balochistan to Khyber Pakhtunkhwa, Punjab and, finally, Sindh. MSF’s emergency effort focused on ensuring that people were able to access medical care, free of charge, and had clean water that was safe to drink, so as to prevent possible outbreaks of diseases. MSF also delivered essential goods to help victims of the floods maintain a basic standard of living. At the beginning of the crisis, MSF focused on working where the needs were greatest and reaching as many people as possible. As more aid organizations started up operations in the flood-hit areas, MSF shifted its focus to populations who were difficult to reach. In some areas, communities had become geographically cut off by the floods and reaching them was a logistical challenge. In others areas, people were hard to reach due to insecurity, and at times MSF’s efforts were hampered by the compromises made by other aid organizations in accepting armed protection from the police and the military. MSF does not use armed escorts for its staff on principle, nor does it allow weapons inside health facilities where it works. Six months after the floods, many people have started returning to their homes. Others, however, still lack basic needs, such as food and shelter. For this reason, MSF teams in Dera Murad Jamali, in Balochistan Province, and in Johi and Karachi, in Sindh Province, are continuing their activities, running nutrition programs, and providing essential items and transitional shelters. MSF plans to carry on working in Pakistan on long-term projects throughout the country while remaining prepared to respond to any future emergencies that may happen. The devastation left by the floods disrupted people’s lives and affected both their health and their ability to get medical treatment. MSF teams rushed to ensure that flood victims were able to see a doctor, free of charge. MSF began by setting up mobile clinics, diarrhea treatment centers, and nutrition programs, and went on to improve health care for mothers and children, develop mental health services, and disseminate information on health issues. “I had been sick for a week and I didn’t have enough food for my six children, let alone (money) to pay to see the doctor. I am glad that now we can get medicine for free in this center.” —Patient at an MSF diarrhea treatment center in Kot Addu, Punjab Province. During the floods, numerous local health clinics were damaged by the floodwater, and many collapsed. MSF teams worked to ensure that health facilities could function again: cleaning them, providing a safe supply of water and electricity, donating equipment, and stocking them with medicines. MSF doctors also provided medical support to several hospitals, in outpatient departments, emergency rooms, and medical wards. In the camps for displaced people and in remote areas where many people were without access to health care, medical teams ran 15 mobile clinics to make sure that people had the medical support they need. By the end of January 2011, medical teams had provided a total of 106,616 health consultations to victims of the floods. Many of the health problems they saw were directly flood-related, including diarrhea, skin infections, eye infections, and trauma. Other conditions were unrelated, such as acute respiratory infections, dengue fever, measles, tetanus, and jaundice. Where people have returned to their homes, MSF teams have rehabilitated local health clinics to ensure that returnees have the same level of health care as they did before the floods. People displaced from their homes by the floods often had to cope with poor living conditions in temporary camps, as well as a lack of food, clean water, and adequate sanitation, all of which caused a rise in the number of patients suffering from diarrhea. MSF teams set up seven diarrhea treatment centers to provide intensive care to those in need until they were fully recovered. Teams also set up 22 points for the treatment of severely dehydrated patients and the distribution of hygiene kits and water purification tablets to help halt the outbreak. Health messages promoting hygiene and sanitation were disseminated in several camps and villages to stop the diarrhea outbreak from spreading. The floods destroyed the harvest and damaged farmers’ fields while affecting the next season's harvest, as well. As a result, malnutrition has been a problem among flood victims. From the earliest days of the emergency, treating malnutrition was part of the mobile clinics’ activities in Sindh and Balochistan provinces. Medical teams began by screening children under five years old and pregnant and lactating women. This was done by measuring their middle upper arm circumference and calculating their height-to-weight ratio. People identified as malnourished were provided with ready-to-use food and weekly check-ups at MSF’s outpatient feeding centers. Those who were severely malnourished and suffering from medical complications or opportunistic diseases such as malaria, tuberculosis, or pneumonia, were admitted to inpatient feeding centers. There they received specialized care until they were well enough to join the outpatient feeding programs. MSF also ran a center in one of the camps for displaced people. Teams provided daily care for malnourished children who were refusing to eat or failing to gain weight. Those affected by the floods frequently moved from place to place, and it was a challenge for the nutrition teams to make sure that malnourished children completed their full treatment program. MSF health promotion teams working in the camps and in the inpatient therapeutic feeding centers helped to boost mothers’ understanding of the treatment process and raise their awareness of the importance of breastfeeding, good nutrition, hygiene, and disease prevention measures. By the end of January 2011, MSF medical teams had screened over 97,000 children and pregnant or lactating women for malnutrition, and had treated 8,800 malnourished children. Teams in Jamshoro and Karachi are continuing to monitor the nutrition situation closely in case the need for further assistance should arise. In the rush to escape the floodwaters, expectant mothers and babies were particularly vulnerable. With mother and child healthcare projects already running in different parts of the country, MSF teams scaled up their efforts to care for the health of mothers and children in the wake of the floods. A large influx of people in Dera Murad Jamali saw a significant increase in the number of births, Caesareans, and complicated deliveries. Between August 2010 and January 2011, the team assisted with 516 deliveries, 82 of which were Caesareans and 434 of which were complicated deliveries. 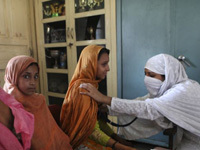 A Pakistani MSF nurse examines female patients during a mobile clinic inside a school where displaced people were taking shelter in Tarnab, near Charsadda. Babies whose mothers had had complicated deliveries were transferred from the MSF-run maternity ward in Dera Murad Jamali to an around-the-clock nursery next to the inpatient department. Between August 2010 and January 2011, 339 newborns were admitted to the nursery. For many people, coming to terms with the losses they had suffered during the floods and the hardships of displacement caused feelings of anxiety, stress and depression. To help them, MSF integrated a mental health element into its emergency response, with psychologists providing individual and group counseling to those in need of mental health support. MSF health promotion workers played a vital role in raising people’s awareness about health risks in the wake of the floods. They worked with both the medical teams and the water and sanitation teams to address knowledge gaps among people displaced from their homes. At the beginning of the emergency, health promotion workers developed health messages to promote hygiene and sanitation in various camps and villages to mitigate the risk of an epidemic. As the emergency phase wound down, the health promotion workers adapted their work to people’s needs, from raising awareness about hygiene and disease prevention measures to increasing knowledge about breastfeeding issues, malnutrition and chronic diseases. The floods destroyed much of the infrastructure for supplying water while also contaminating water sources in various parts of the country. This caused severe shortages of clean water in flood-ravaged areas and posed a serious threat of epidemics. Preventing waterborne diseases was one of MSF’s top priorities, and teams rushed to rehabilitate local water delivery systems while trucking clean water to families who needed it. They installed water points, water tanks, water bladders, and water taps, and provided jerry cans, hygiene kits and water purification tablets to communities to ensure that flood survivors had constant access to clean water. The teams also helped chlorinate water in health facilities to ensure that sick people were not given the same contaminated water that had made them ill in the first place. They also constructed latrines, showers and hand-washing points so that people had adequate sanitation facilities. The water and sanitation teams are continuing to repair damaged hand pumps and to install new hand pumps to make sure that people returning to their homes have a good supply of clean water. By January 2011, the teams had provided 2.1 million liters of safe water a day, installed 271 hand pumps, and ensured that each flood-affected person had at least 10 liters of water per day. They also installed 709 latrines, 280 showers and 130 hand-washing points for individuals and families living in camps and temporary shelters. For people displaced from their homes, MSF provided emergency shelters and basic necessities to ensure a minimal standard of living and prevent the spread of disease. The relief items included cooking utensils and hygiene kits consisting of soap, toothbrushes, towels, buckets, a jerry can, plastic sheeting, and water purification tablets. To date, MSF has distributed 73,708 kits of relief items and 22,629 tents, benefiting more than 500,000 people. Six months after the floods, many people have left the camps and returned to their hometowns, only to find their houses totally destroyed by the water. MSF has provided 2,000 transitional shelters to families in Jamshoro and Johi. The shelters each have an area of 25 square meters and are constructed from bamboo and plastic sheeting. They are designed to last for a year, providing people with time to start rebuilding their homes and their lives. 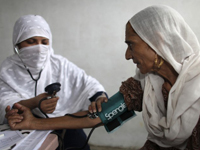 Since 1988, MSF has been providing medical assistance to Pakistani nationals and Afghan refugees suffering from the effects of armed conflicts, poor access to health care, and natural disasters in Khyber Pakhtunkhwa, Balochistan, Punjab, and Sindh provinces, as well as the Federally Administered Tribal Areas and in Kashmir.